Maxham’s expertise is broad, and his book equips problem solvers across a variety of disciplines. The Art of Troubleshooting by Jason Maxham presents a solid theoretical and practical framework for solving real-life mechanical problems. The book is organized in four parts. First, Maxham shares introductory fix-it ideas like a structured approach to problem solving, and includes a flow chart that covers each step: “define problem,” “gather information,” “analyze,” “eliminate,” “propose hypothesis,” “test hypothesis,” and “solve problem.” Part 2 is the heart of the book: adaptable, practical problem-solving strategies from skillful questioning to changing point of view. These tactics give concrete ways to avoid roadblocks on the path from problem to solution. In part 3, Maxham explores a fix-it person’s needed character traits, like skepticism and creativity. 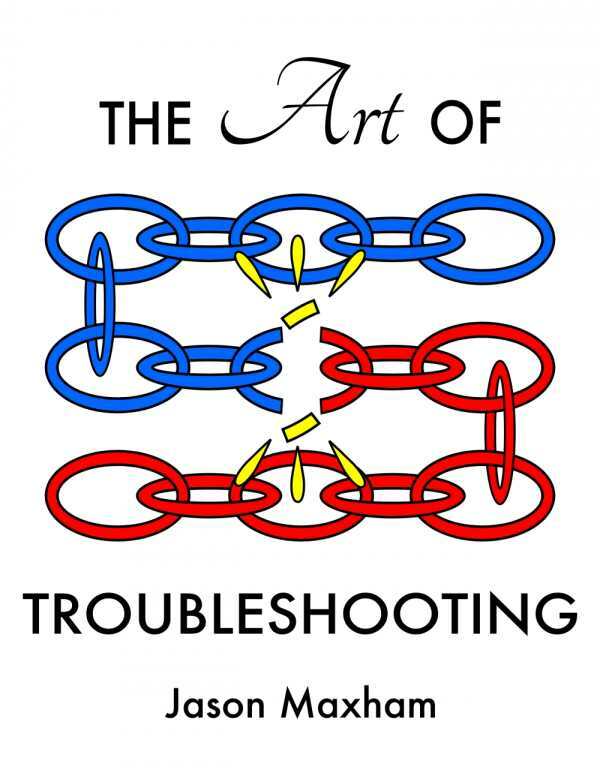 Finally, the book discusses proactive troubleshooting ideas, like how to maintain a system to avoid problems and predict when trouble is coming. For some natural-born fix-it people, this book will explain the obvious, but for those who may not be as logically or mechanically inclined but are sick of being flummoxed by day-to-day repair issues, this book presents the strategies and mindsets that underlie nearly all mechanical problems. The book is in a large format and is text heavy, so it’s not a quick reference for when there’s a problem immediately at hand. Instead, this is a handyperson’s textbook, a training manual for problem solving. Once read, it’s a great brainstorming reference for someone in the thick of a confounding problem. While it seems far-fetched that one book could teach how to troubleshoot any machine, especially in an era when technology is changing and gaining complexity each day, Maxham does an admirable job. Most repair manuals are focused on the type of problem, but this book’s unique focus on the ideas and strategies that underlie solutions make it a nimble, useful volume. Maxham’s expertise is broad rather than deep (from aviation to computer programming), and his book equips problem solvers across a variety of disciplines. Maxham’s tone is informative and encouraging, with lots of wisdom and hints of humor. The numerous tables, charts, and photos give clarity—and sometimes levity—to the book’s ideas. They detail everything from assembly-line malfunctions to drive-shaft gears to computers with redundant network connections. The book could do a better job of announcing its useful content. A subtitle and a slightly more literal rather than figurative cover image would help communicate the book’s audience and purpose. The type on the table of contents is very large, and the hierarchy of parts and chapters is not visually clear. Overall, this book is an excellent source to help equip everyday people with the tools to become successful fixers.